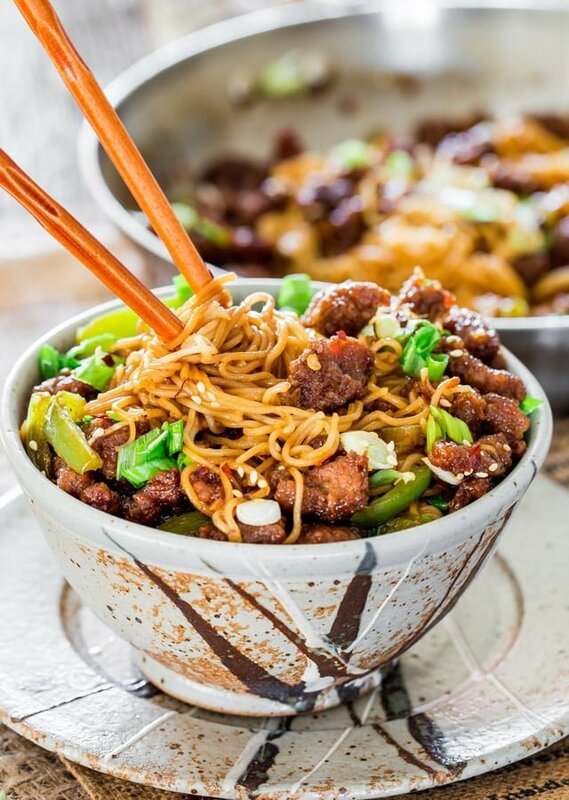 Mongolian Beef Ramen Noodles – a copycat recipe of the popular PF Chang’s Mongolian Beef with green peppers and ramen noodles. So simple to make and so delicious, you’ll want to forget about takeout! What can I say other than I was really craving Mongolian beef, it’s one of my favorite dishes. And I just so happen to have had a big bag of ramen noodles I bought from Costco. I used my original recipe for PF Chang’s Mongolian Beef but I modified a bit because I wanted more sauce for the ramen noodles. I love ramen noodles but here I am at my age, and I’m not going to tell you my age, and I can honestly say that I can probably count on one hand how many times I’ve had ramen noodles. I know it’s supposed to be a thing for college students, but when I went to university I lived at home and when I wasn’t eating on campus I was eating my mom’s home cooked meals so I missed out on all the ramen noodle craze. Maybe I need to make up for it now? Just saying. Anyway this Mongolian beef is unbelievable, it’s so good and you wouldn’t believe how easy it is to make. Start by cutting your flank steak into small pieces, I like mine really small thin pieces. Add the cornstarch and steak pieces to a ziploc bag and close the bag then just shake the bag to make sure all the beef pieces get coated in the cornstarch. No need to season this with salt and pepper because the sauce we’re going to make for this has plenty of salt from the soy sauce. Fry the beef first in some vegetable oil, about 3 minutes or so until the beef is nicely browned. You’re going to want to do this in batches, 2 or 3 because you don’t want the beef pieces sticking to each other. You don’t want to overcook it. Then just because I wanted some veggies I added a bell pepper, though if you look at the radio of beef to pepper it’s pretty pathetic, but hey I’m all about the meat. You just want to saute the pepper for a couple minutes until it softens up a bit, but I still like mine with a bit of crunch to it. In the same skillet add all the sauce ingredients and bring to a boil. Once it’s boiling, turn the heat down to a simmer and cook for about 10 minutes until the sauce thickens a bit and reduces by a quarter. Now all you have to do is add the beef and peppers back to the skillet and toss everything together. It’s so good, at this point you can eat this with rice if you want. 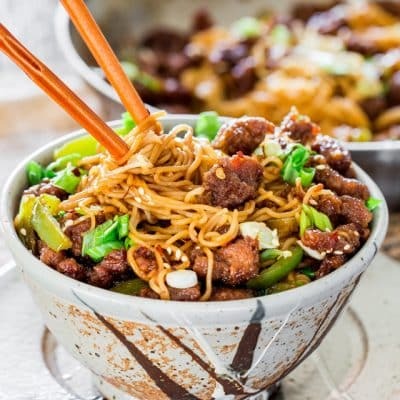 But if you want to go down the ramen noodle road, then just add your cooked ramen noodles to this, toss everything together really well, top with chopped green onions and enjoy. I used only 8 oz of dry noodles but there is enough beef in here to add a lot more noodles. This really is one of my favorite dishes and it’s so good I was tempted to eat right out of the skillet. 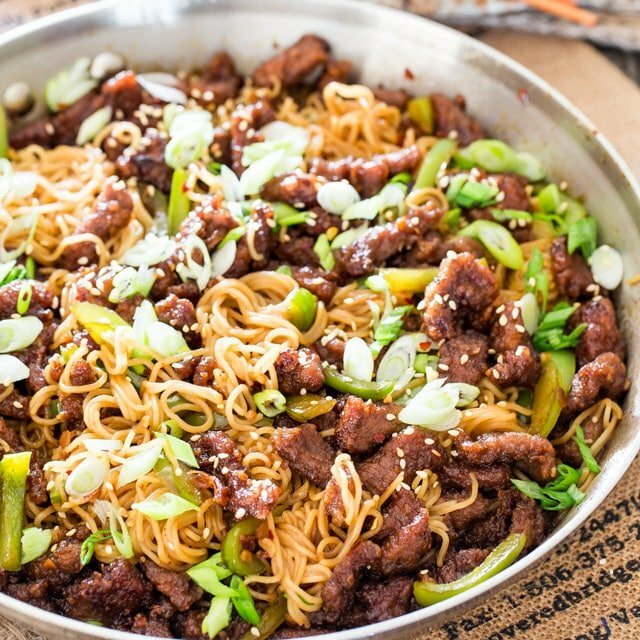 If you’ve never tried Mongolian beef you should try this recipe, you’ll love it. 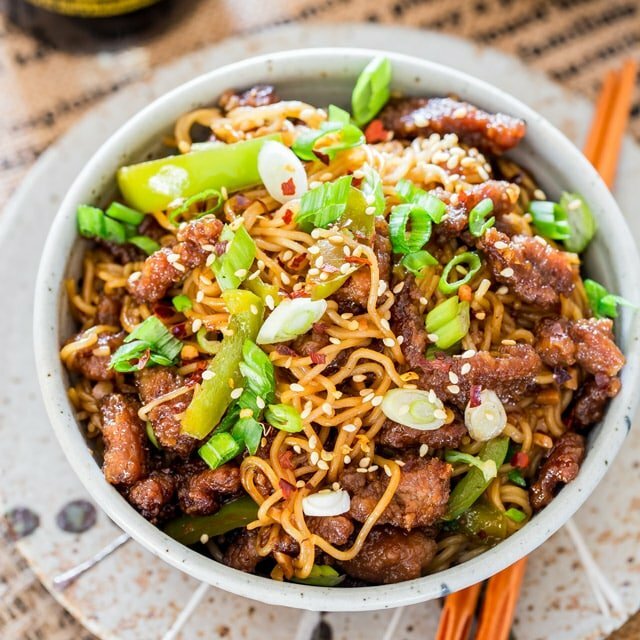 Mongolian Beef Ramen Noodles - a copycat recipe of the popular PF Chang's Mongolian Beef with green peppers and ramen noodles. So simple to make and so delicious, you'll want to forget about takeout! Slice the flank steak into small thin pieces against the grain. In a large ziploc bag add the starch and the beef to it. Close the ziploc bag and shake really well until each pieces is coated with cornstarch. In a non stick skillet heat the oil. When the oil is hot, add beef and cook until browned. It will take 2 or 3 batches because you don't want the steak pieces to stick to each other. Also if you need more oil after the first batch feel free to add more. 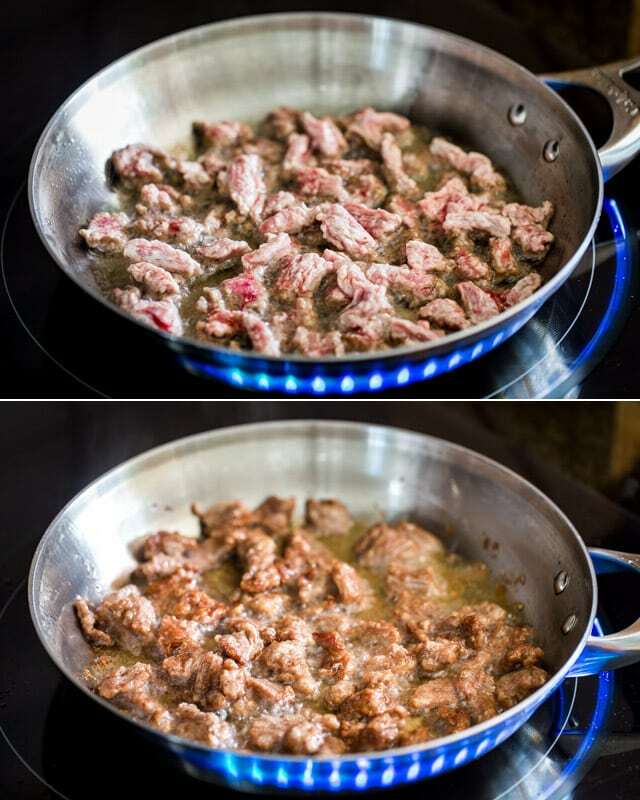 Remove beef from skillet to a plate and empty the oil from the skillet. Add the bell pepper to the skillet and saute it for a couple minutes just until it gets soft. Remove the pepper from the skillet to a plate and set aside. In that same skillet add sauce ingredients, the sesame oil, soy sauce, brown sugar, garlic, chicken broth and red pepper flakes. Stir and cook over medium heat until sauce thickens a bit and reduces by about a quarter. It took me about 10 minutes until the sauce thickened and reduced. You don't want to reduce it too much because you need more sauce for the noodles. In the meantime cook the ramen noodles according to package instructions. 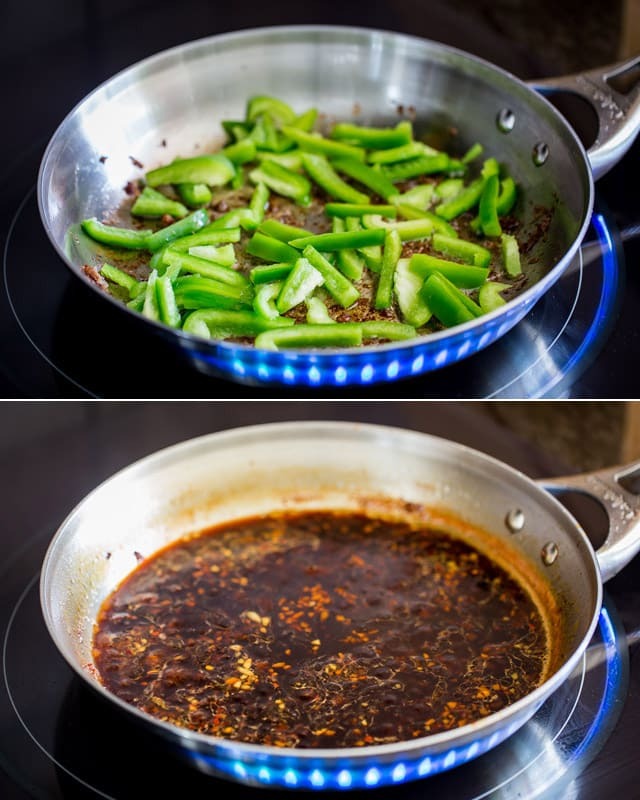 Return the beef and bell pepper to the skillet and toss in the sauce. 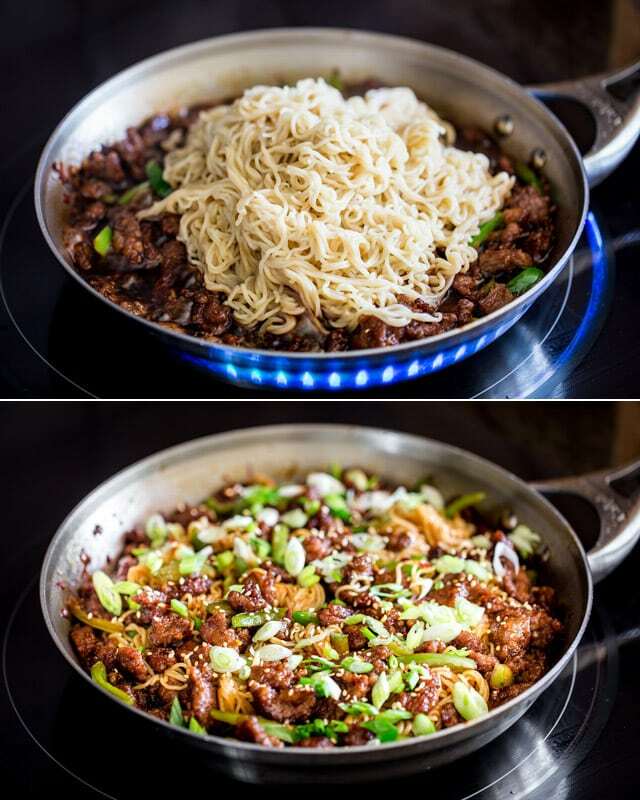 Add the cooked ramen noodles to the skillet and toss everything together. 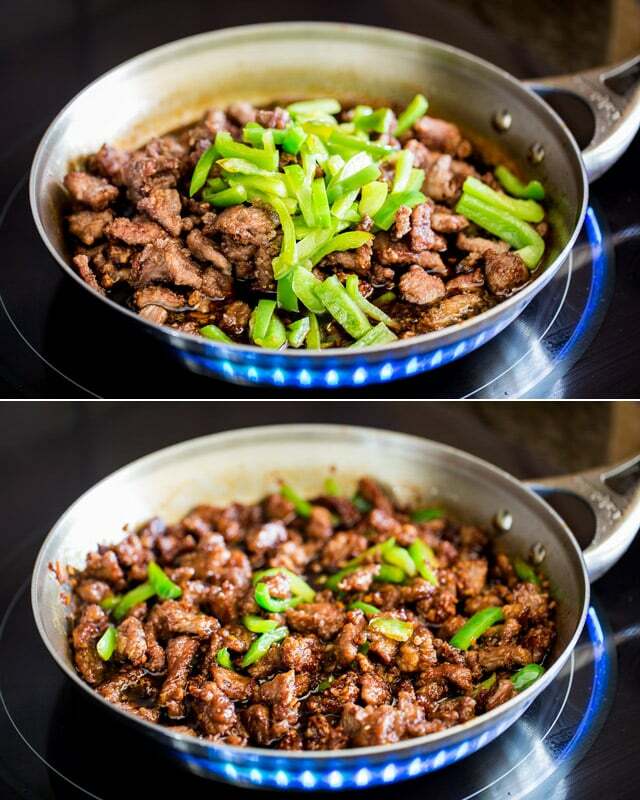 Top with green onions and serve. You can find ramen noodles in the Asian aisle of your local grocery store. 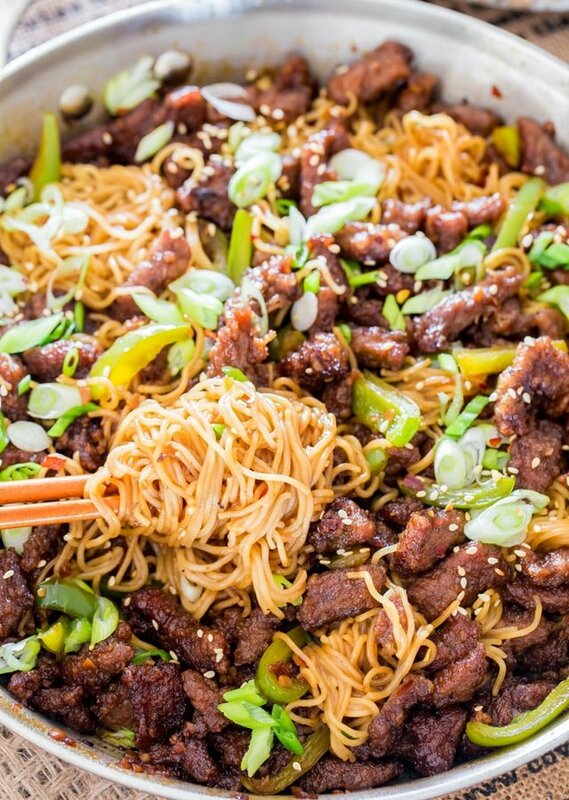 You could also use any other Asian style noodles. Since there's a lot of soy sauce in this recipe, I strongly recommend using a low sodium soy sauce. This dish is an absolute delight and it immediately became our favourite… I only added a bit five spice to the cornstarch and mixed with the beef. Worked wonderfully.. The recipe is very well balanced.. This is a great meal! My husband loves it. We use steamed broccoli, it soaks up the sauce and makes it delicious! Excellent dish. Followed recipe exactly but made a few modifications. Wife does not like green peppers so substituted rough chopped sweet onions. Also added broccoli florets (1 1/4 cups) and 1/4 of carrot sliced with a potato peeler. Dish was outstanding. Will definitely make again in our dinner rotation. Thank you so much for sharing this great recipe! It’s so quick and easy and my whole family loves it!